I previously knew a little about Anne Willan. I knew that she is originally from England, founded the La Varenne Cooking School, and has written some very well-received cookbooks. But, after reading a review copy of her memoir, One Souffle at a Time , I learned so much more about her life, her work, and her travels. After attending Cambridge, she wasn’t interested in following the current trend of young women who “were out pecking for a husband, (when) business careers, even for women graduates of Cambridge or Oxford, were a rarity.” She took a position as a cooking teacher at Winkfield, a cooking and finishing school she had attended one summer, and so began her career in food. Next, she completed the advanced course at the Cordon Bleu Cooking School in London and then began teaching there. Then, she was off to France to attend the Paris Cordon Bleu after which she taught French cooking to the staff at Versailles for fundraising dinners. It wasn’t long before her move to the US to live in New York where she quickly enough landed a job with Gourmet magazine. She married her husband in Costa Rica, moved to Washington DC, and became the food editor of The Washington Star. She traveled with her husband for business and pleasure with one trip including stops in Japan, Hong Kong, Bangkok, Delhi, Tehran, Isfahan, Persepolis, Jerusalem, Jordan, and Cairo. She wrote the Grand Diplome Cooking Course for an American audience while seven months pregnant. And, after her second child was born, she was working on her book Entertaining Menus. It wasn’t long before she, her husband, and children moved to Paris where she started planning for La Varenne, and many more books came later as well. Her life sounds like a never-dull whirlwind of cooking, writing, entertaining, teaching, and traveling. I’ve breezed through some moments of her past, but it’s all so much better described in the book. And, each section is accompanied by a recipe that corresponds to an anecdote like the Shrimp and Cheese Souffles that she prepared for Craig Claiborne in Manhattan, the Gourgeres from a reception attended by Julia Child and James Beard, and a Red Wine Tart served at a summer party at her chateau. 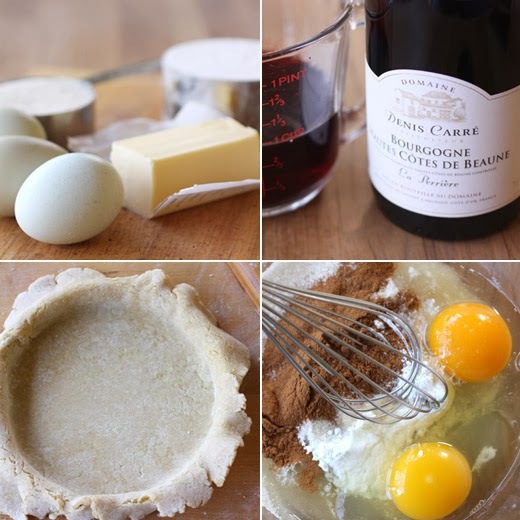 I was fascinated by the idea of a tart with a red wine filling. The chef instructor from La Varenne had discovered the recipe in an old cookbook from Burgundy. In the headnote, Willan mentions that she prefers a particular French pinot noir for this because it pairs well with the cinnamon in the recipe. I brought home a bottle of French burgundy and got baking. The crust is a sweet pate sucree made with egg yolks, butter, flour, sugar, and a pinch of salt. After resting, the dough was rolled and fitted into a nine-inch tart shell. It was blind-baked until golden. The filling was just a mix of two eggs, a half cup of sugar, two teaspoons of cornstarch, and two teaspoons of cinnamon that was whisked together. A cup of pinot noir was stirred in last. It’s noted in the recipe that any froth is to be avoided, and careful stirring is advised. The filling was poured into the tart shell, and it went back into a 375 degree F oven for about 20 minutes until the center was set. It was served with whipped cream. The flavor is fruity but vaguely so, and the cinnamon is front and center. I think I was expecting a redder looking tart, but the color is almost like chocolate which is not a bad trade-off. It’s a great dessert for a dinner party, and it’s an easy one to prepare. I was as delighted to learn about this red wine tart as I was to read this memoir. In Switzerland we also make wine tarts (red & white) that look very similar to this one... A delicious treat! I have never had a wine tart but it sure looks delicious. I printed your post so that I can give this a try. I also find the idea of tart with red wine filling really fascinating. Your tart looks so delicious! An amazing wine tart, Lisa. I still have some rose wine left...might give this a try this weekend. You've just taught me about something totally new in the culinary world, Lisa! How elegant! Is there a recipe for the crust? I am intrigued & want to try, thanking you in advance. Junell: I didn't have permission from the publisher to include the recipe this time. Any pastry recipe would be great here for the crust. The ingredients from the book for the crust are: 1 1/2 cups flour, 1/2 cup sugar, pinch of salt, 5 tablespoons butter, 3 egg yolks. What an interesting tart recipe, Lisa. Red wine and cinnamon? I'm sold! I love using red wine in dessert because it's so unexpected! This tart looks absolutely lovely. Definitely dinner party-worthy! 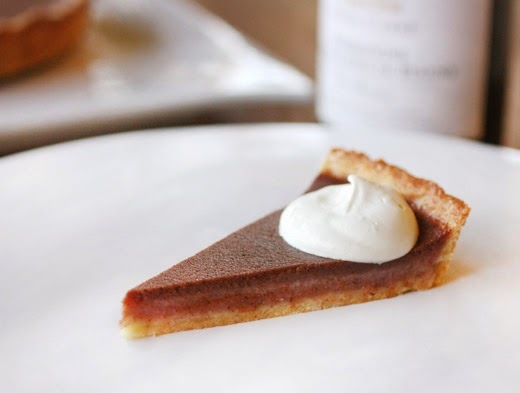 Red Wine Tart is new to me and I am so intrigued! Thank you for the introduction to this lush dessert recipe! It would be perfect for Valentine's Day! This tart has a wonderful and quite unusual combination of flavors, yummy! Thanks about the information about Anne Willan, very interesting . I've never eaten, much less made, a red wine tart. This sounds wonderful! And the info about Anne Willan is really interesting -- I know of her, but haven't used any of her cookbooks. Sounds like I should! *I'm* fascinated by a tart with red wine filling. What a unique recipe. I've never heard of Anne Willan, thanks for that information. Red wine tart is unique indeed. The tart looks so elegant and perfect way to finish a meal. Thanks for sharing. The pie looks wonderful, and the memoir sounds terrific. I'll have to look it up - sounds like a great read for a winter evening. Wow Lisa, this sounds so good. I just love when food bloggers do unique eats. Classy, elegant, and unusual… I'm loving this! I was confused at first that it was a chocolate tart with a little red wine added for extra flavor. Then I went back and read more carefully. Interesting! I can't even imagine what it tastes like. Would you make it again? Shelley: The flavor is very cinnamony with some fruitiness that's somewhere between grapes and berries. I would definitely make it again, especially if I have extra wine! i've tried lots of red wine these last few years, but i've yet to find one that didn't taste terrible to me. in tart form, though, i'd wager they'd all have a better shot! What an unusual tart. And so sophisticated, too. Pinot is my fave wine, too, so this is right up my alley. Now I'm wanting to know more about Anne Willan. 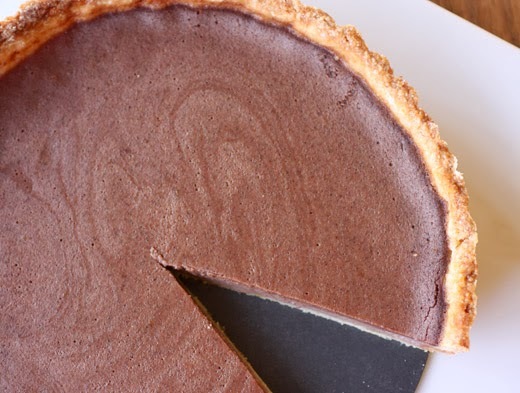 Interesting post and a beautiful tart. Anne Willan is a genius and has long been one of my cooking heroes. What a lovely profile you have presented. And what a glorious tart! Complimenti!